It looked for a while that Andy Murray could do it. At one set ahead and 4-4 in the second, he had break points to give himself the opportunity to serve for a two set lead. His backhand drive flashes millimetres long, and from then on, the true Roger Federer appeared. Like poking a sleeping bear, Murray had awakened a beast. In a performance that was as murderous and savage as it was beautiful, Federer rose from the ashes like a phoenix. Dragging Murray around the court as though he were on strings, every part of his game was functioning in sublime style. The drop-shot that brought him set point came out of nowhere and the slicing volley that settled it may as well have cut the lifeline for Andy Murray. Once the rain came and the roof closed, there was no longer any doubt as to who would win this match. While there is still debate as to whether Federer is the greatest player of all-time, there is no doubt that he is unparalleled indoors. Even in these so-called decline years, he has lost one match indoors in the past three years, back in November 2010. Since then, he has won 26 consecutive matches under a roof. Nadal, Djokovic, Murray, Ferrer, Berdych, Tsonga and Del Potro have all attempted to derail the Fed Express. In truth, they have all struggled to take a set. 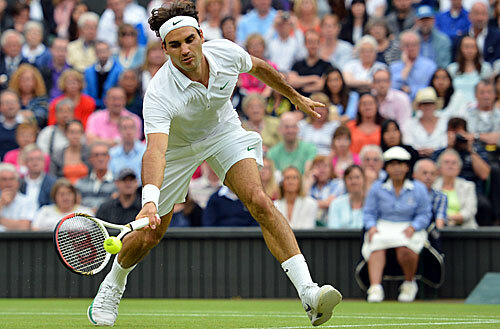 Under the roof, in the absence of wind and sun, there is nothing that can impact the elegance and beauty of his game. In the second game after the roof closed, he made his move. Murray was sprinting around the court, while Federer seemed to glide. Forehands, backhands, volleys and lobs; each placed to perfection with power and accuracy. Murray fell to the turf twice, but, showing great spirit, refused to die. Eventually, as if satisfied with toying with his prey, Federer executed a stunning lob, leaving Murray lying on the floor for a third time, before sealing his fate with an unstoppable backhand. Into the deciding set, Murray still refused to give up. The moment when you knew you were watching sheer genius came in the fourth game. As Federer lined up the drop-shot, Murray anticipated it to perfection. Charging into the net, he could only stand and stare as Federer sliced the ball deep into the corner. Few players would even have considered that shot. Only one is capable of pulling it off. Murray stood at the net, staring in disbelief at Federer. Federer allowed himself a brief smile. It was the smile of an assassin. Federer broke in the very next game, confirming the break with the most exquisite one-handed backhand passing shot. Barely fifteen minutes later, the greatest artist that the game has ever seen collapsed to the turf in celebration. A record-equalling seventh Wimbledon title, a seventeenth Grand Slam title and a return to number one, where he will break Sampras’ record for the longest spell at the top of the game. After almost three years, Roger Federer held a Grand Slam trophy above his head. The challenges that he has faced have made him a better player technically now than he was in his peak. His forehand is still one of the most potent weapons in tennis, while his backhand, once a relative weakness, is now a glorious shot. His serve is still criminally underrated, while his ability to seemingly land returns on Murray’s baseline was outstanding. Many people, including myself, were questioning whether Federer would ever be able to challenge for a Grand Slam title again. He has proved the critics spectacularly wrong. He overwhelmed first Novak Djokovic and then Andy Murray, making them appear distinctly average. It would be difficult to bet against him now adding the one achievement that is missing from his bulging trophy cabinet. While he possesses an Olympic gold medal from the doubles four years ago, it is that elusive singles gold that he covets. And woe betide anyone who dares to stand in his way. Records are meant to be broken but Federer shows he still got games.Let see if Nadal & Nole will still play competitive Tennis until his age.He is just amazing and he seems to want more and that is what make him different.Fed just go for more slam until you are tired. Great post Ian, from statistican to wordsmith, you've got all the blogging bases covered. What is it about Federer's game that makes him unstoppable indoors? Answers on a napkin please.